When I arrived at Wayzgoose Saturday morning Tim asked me how someone could get lost in Grimsby. I’ll admit, it does seem rather comical that someone could get lost in the tiny Ontario town of only 25,000 people—but the half hour I spent driving around Main Street proves that it can happen. My only defense: some of those street signs are very small! When I actually got myself to the Public Art Gallery (finally sighting the desired street sign, squinting desperately as I crawled along Main Street, I made a sudden, hard right onto Ontario Street and spotted the gallery only a block away), I was dismayed to see that the sign announcing Wayzgoose! pointed in two completely opposite directions. One, to the left, toward the Art Gallery and new library building, the other, to the right, toward the old library building. Impossible! So I set off for the old library building. There was a list tacked up on the door. I scanned down. Porcupine’s Quill: Library, it reported. Perfect. I brashly rushed inside … into a very small, very quiet room with very creaky wooden floors. I looked around, recognized Will Rueter of the Aliquando Press and saw Wesley Bates sitting at the table next to him. I scanned the room desperately—no Tim Inkster. I approached Will and Wesley smiling. As fortune would have it, Wesley recognized me and smiled back. But, seeing my expression, said “You look lost,” in a concerned tone. No words could be closer to the truth. Perpetually lost. Lost all morning! “I can’t find Tim,” I said, laughing. And Wes, thank goodness, promptly gave me very good directions out of the old library building, across the path, and into the new one where Tim, he told me, was at the end of the long row of artisans’ tables. With much thanks, I left Wesley and Will and made my way into the new library building. As soon as I walked in the door I knew I was in the right place. Michelle Walker and her husband George A. Walker were directly on my right with George A. Walker Books set up and selling at full force. The library was a crush of people, milling about, admiring artist’s handiwork, saying hello to old friends. I made my way through the crowd and squinted down the rows of tables. And indeed, as Wesley directed, I made out Tim Inkster and all the lovely, familiar, PQL books at the very end. When I arrived I smiled, waved, confessed I had gotten lost, apologized for my tardiness. “How do you get lost in Grimsby?” Tim asked. 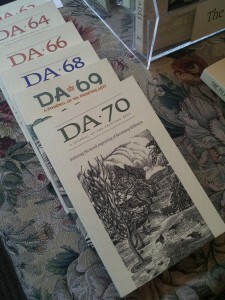 Launching DA 70 at Wayzgoose. The Wayzgoose in Grimsby began in 1979 as a small gathering of friends and colleagues who had a similar interest in the book arts. Since then it has grown into an eagerly awaited annual reunion of practitioners of traditional book crafts, drawing artisans from across Ontario, and even from Québec and the north-eastern United States. Now entering its 34th year, this year’s Wayzgoose boasted letterpress printers, printmakers, paper makers, hand bookbinders, and small and private presses of all different types. I was happy to finally get the chance to see the work of Nicholas Kennedy’s Trip Print Press. I met a few new Kingston-based printers and was also able to catch up with the Kingston-based Margaret Lock of Lock’s Press. Margaret and her husband, Fred Lock, produce beautiful books and broadsides. They generally publish unusual but enduring texts, ranging from classical Greece to the early twentieth century. Fred chooses the copy text and often supplies the translation while Margaret illustrates the text and sets the type. Their work is composed carefully, encouraging their audience to read leisurely and reassess difficult and seemingly inaccessible texts. For the Porcupine’s Quill, Wayzgoose has come to be a way to stay connected to the community of wood engravers and book artists in Ontario. In fact, PQL’s first collection of wood engravings, Wood, Ink & Paper began as a conversation between Tim Inkster and wood engraver Gerard Brender à Brandis at Wayzgoose over thirty years ago. Since then, PQL has published several art books with Brender à Brandis and other artists, such as Wesley Bates, Jim Westergard, and, of course, George A. Walker. Today the Porcupine’s Quill is known for its interest in wood engraving and expertise in creating high-quality reproductions at affordable prices. And this year was no different. This year, Wayzgoose was the official launch of two new works featuring Ontario wood engravers, The Mysterious Death of Tom Thomson and the most recent issue of The Devil’s Artisan, featuring the wood engravings of Rosemary Kilbourn. 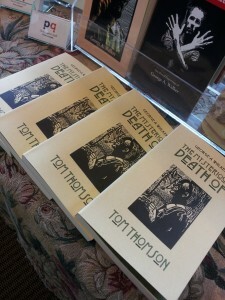 It was delightful to see them prominently displayed on our table. But it wouldn’t be Wayzgoose if there wasn’t some talk of acquisition … when the men came back from lunch at the pub there was a great deal of talk about a potential new PQL title…. 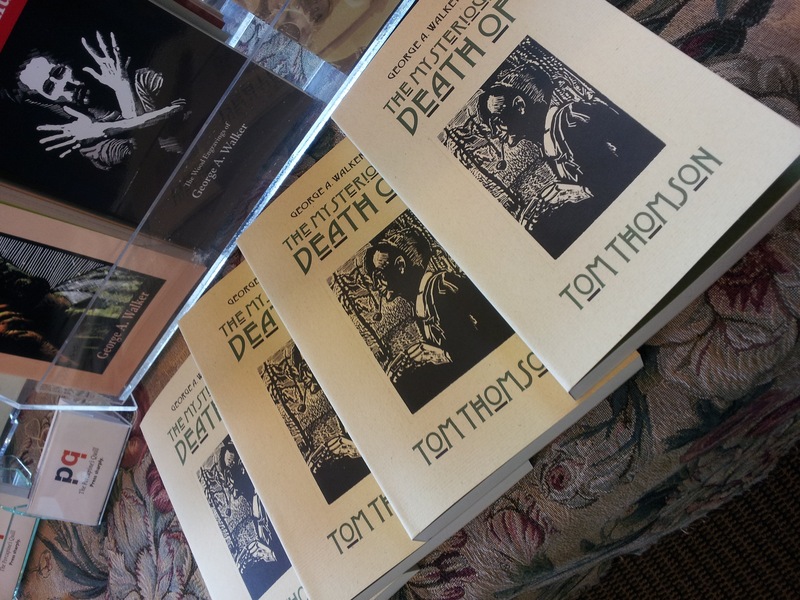 The Mysterious Death of Tom Thomson spread across the front of our table. We were grateful for the grey cloud cover that persisted all day—as Tim tells me, if it’s sunny everyone stays home and gardens. Many thanks to those who came by to say hello, and even more thanks to new friends who came by to learn about the Porcupine’s Quill. We look forward to seeing you all next year, when I will, hopefully, be able to find the turn off the Main Street the first time! Keep following our blog for more fun updates about the Porcupine’s Quill. Until then … Porcupette out! This entry was posted in Letters from the Porcupette (the Intern's Blog) and tagged Aliquando Press, DA 70, Lock's Press, Margaret Lock, Rosemary Kilbourn, The Mysterious Death of Tom Thomson, Wesley Bates, West Meaddow Press, Will Rueter. Bookmark the permalink. Don’t feel bad, Kate! I got lost in Erin. You’re not the only victim of the small street signs! Indeed! That’s the problem with publishing hopefuls. Always thinking about books, never bothering to read street sings….